Leave the myths and fears behind and focus on your contortion goals in a positive and encouraging environment. Muscle flexibility can be acquired with persistent training. Contortion class will push the limits and allow for a more in depth understanding of how to execute advanced poses in proper alignment. 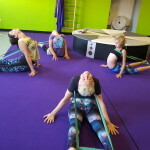 This more challenging and vigorous led class utilizes traditional Mongolian and Russian style contortion techniques, stretches, and poses as well as dance, gymnastics and acrobatic movements with constant motion, arm balances, inversions, breath work, and awareness. Contortion class will focus on extending students flexibility and stamina to hold through poses and multiple movements with fluidity. While pushing your flexibility further, we will be aiming for oversplits, toes to your head and beyond, more full back curvature, and forward folds. The safe and gradual development of strong, balanced flexibility is top priority in pre-contortion and contortion classes. Circus School rule – always listen to your body! If something doesn’t feel right, don’t push through it. Know the difference between the burn of a good stretch and going to far. Stop before you get to that point and always go into poses slowly and with control.This class is for people who maintain a regular flexibility and strength routine and are ready for some next level contorting. Students will leave this class knowing how the moves of a professional circus contortion routine are executed. The instructor will also be helping students build solo, partner (once you have met the prerquisites), and group contortion routines. This is a 75 minute class. Instructed by Kelsie. $25/class. When you sign up and prepay for the whole 6 week course the price per class is discounted to $20/class. We are excited to announce that we will now be bringing in guest artists in for monthly workshops. Keep posted on upcoming flexibility workshop dates by following us on Facebook and by registering online through The Last Carnival calendar page. 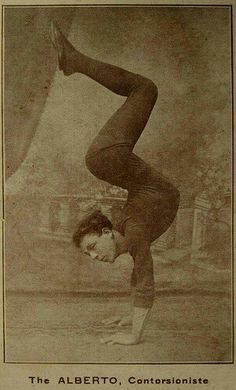 Many myths and fallacies have been perpetuated about contortionists; most of them are because of the general public’s unfamiliarity with human anatomy and physiology, while some are showman’s hype that has been invented by the performers themselves or their promoters in order to make the act appear even more mysterious. Myth: Contortionists apply snake oil to their joints or drink special elixirs to become flexible. This was a popular myth in the 19th century when medicine shows hired contortionists to “prove” the effectiveness of their arthritis medicines. Their extreme bending was not actually the result of their patent medicines. Flexibility is the result of either genetics or intense physical training or, more likely, both. Myth: “Double-jointed” people have more joints than most people do. The term “double-jointed” is a misnomer and should not be taken literally, as an individual with hypermobility in a joint does not actually have two separate joints where others would have just one. “Double-jointed” simply refers to hypermobile joints that stretch farther than normal. Myth: Contortionists have to dislocate their joints when they bend unusually far. Since some loose-jointed people are able to pop a joint out of its socket without pain, it may be hard to tell whether a joint is actually dislocated without an X-ray. However, as long as the joint socket is the right shape, most extreme bends can be achieved without dislocating the joint. Actual dislocations are rarely used during athletic contortion acts since they make the joint more unstable and prone to injury, and a dislocated limb cannot lift itself or support any weight. 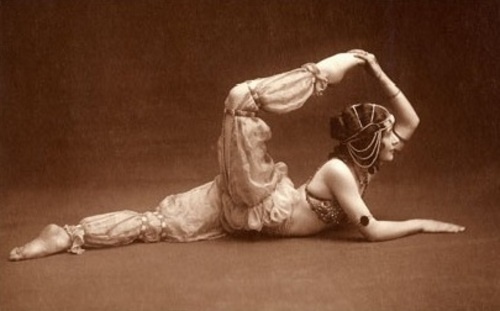 Myth: Contortionists can bend bonelessly in any direction. The degree of natural flexibility of one joint in a certain direction does not determine its degree of flexibility in the opposite direction or the flexibility of other joints in the body. Contortionists can create the illusion of having boneless bodies by specializing in the skills that show off their most flexible joints with the help of their acting talent and mime skills. Muscle flexibility can be acquired with persistent training, as long as the shape of the bones in the joint do not limit the range of motion. There are a relatively small number of professional performers who claim they were not unusually flexible before undergoing years of intense training. Those who have naturally flexible joints, however, start out with an advantage, both in knowing that they have an aptitude for contortion and the amount of flexibility they can eventually achieve. 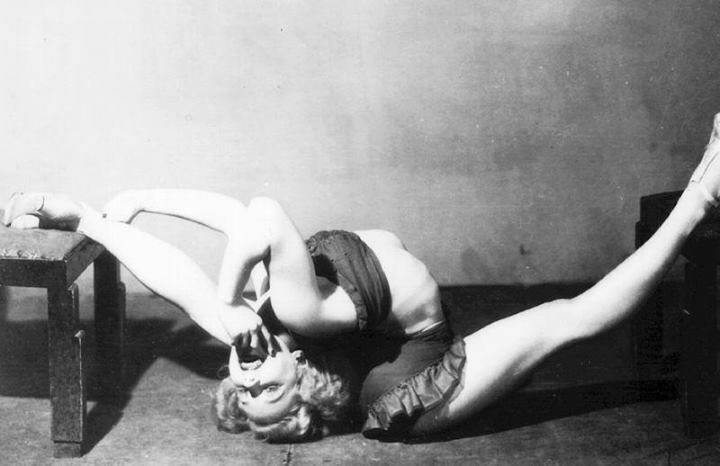 The average woman tends to be more limber than the average man, but pictures of contortionists throughout history and around the world, taken as a whole, show nearly equal numbers of males and females. 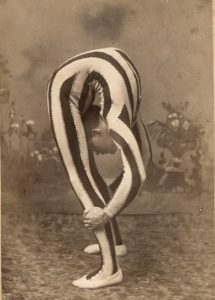 Western contortionists in the late 19th century were mostly men, just as extreme flexibility in modern India is practiced mostly by men.